The Total Carpark was designed by Bogle Bansfield and Associates in 1965. It is one of Melbourne’s best examples of Japanese-inspired Brutalist architecture where off-form concrete is employed in emphatic structural and functional expression. The balustrade treatment and clear expression of load and support is comparable with Kenzo Tanges’s Kagawa Prefectural Offices, Japan (1958). The mixed use building, with an office block resembling a giant television set supported on cruciform concrete beams above a series of floating parking decks, is also possibly the first building in Australia to combine a multi storey carpark, an office building above, shops at ground level and a theater in the basement. 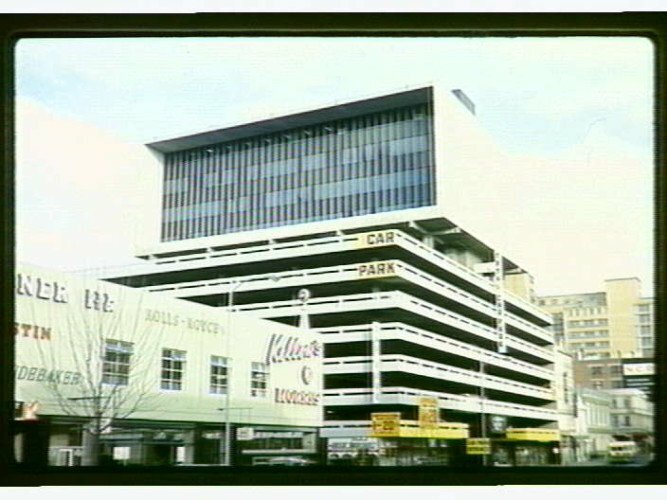 With Bernard Joyce as project architect, the Total Carpark was one of a number of the firm’s innovative designs which included the boldly expressive Mid City Cinemas, Melbourne, St James Church of England, Glen Iris and St Vincent’s Private Hospital, Fitzroy. Total Carpark, or Total House as it is commonly referred to, still comprises parking and retail, although a nightclub replaces the former cinema and the commercial office space now contains several architecture and design practices. What’s Open: Crowd Productions & Shelley Roberts Architect Studio on Level 8 and the north facing balcony. Frequency Of Tours: Self guided tours and balcony access every 15 mintues with 15 people at a time.